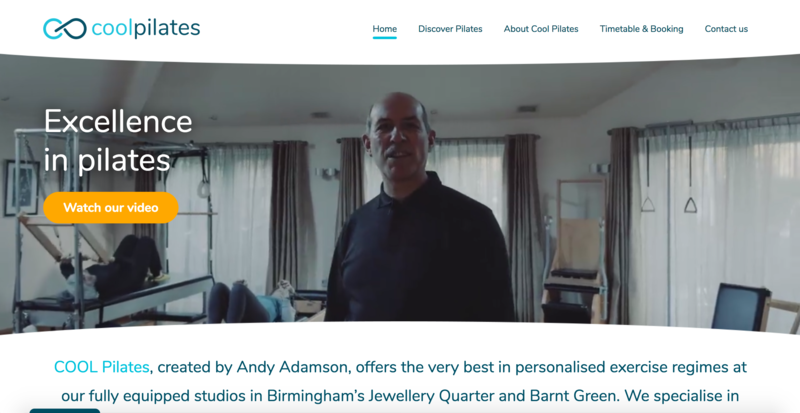 Cool Pilates were on the hunt for modern branding and a state of the art website to reflect their reputation as a leading Pilates studio in the Midlands. Cool Pilates was created by Andy Adamson, who began teaching in 1995. The company, founded in 2007, has studios located in Birmingham’s Jewellery Quarter and Barnt Green. They pride themselves on offering state of the art apparatus and highly qualified instructors. The existing website and branding, created over a decade ago, was starting to look outdated and in desperate need of a refresh. Security vulnerabilities on his old website caused Andy regular headaches and eventually led him to seek the advice of Refresh Studios. Cool Pilates required a website that showcased their state of the art studios and introduced their world class instructors to new customers. It also needed to provide a way for existing customers to book classes online. In addition, the Midlands-based company asked us to give some options on branding that better communicated their offering.